Billie Tarascio is the principal attorney at Modern Law, a family law firm in greater Phoenix, and Access Legal, a legal technology company providing do it yourself resources for self-representing family law litigants. Modern Law was recently named one of the fastest growing firms in the country for the second consecutive year. Its model focuses on the use of technology, customer service, automation, and whole health. How can your law firm use data to make better business decisions? Hear from Billie Tarascio, Owner of Modern Law, and George Psiharis, COO at Clio. 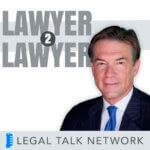 George Psiharis and Billie Tarascio talk about how you can use big performance data to improve your law practice.